The holiday season has rolled around once again, and the townspeople of quaint Serendipity, Pennsylvania, are preparing for their annual Christmas Challenge. This year, the funds raised from the various events and activities will benefit the continuing relief efforts in the aftermath of a brutal hurricane season. Victoria (Tori) Harper agrees to participate in the more physically demanding sporting events of The Christmas Challenge alongside her brother and new father, Donovan, on behalf of his HarperMorgan Advertising Agency. But why has Donovan allowed the insufferable and irritatingly appealing Henry Adams to join their team? The man seems determined to drive her to distraction, but Tori’s not about to fall under the charms of another handsome man with a smooth line, even delivered with Henry’s smooth-as-silk British accent. As the youngest attorney in town, Henry has grown to love little Serendipity, and especially his verbal sparring sessions with Victoria Harper in The Coffee Nook and elsewhere around town. She might call him a Snooty Scrooge, but he’s determined to win her heart. If he can’t win that personal challenge by the end of the holiday season, he might as well move on and accept a tempting job offer from a New York law firm. 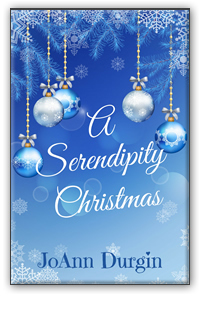 The second in The Serendipity Christmas Series, following The Christmas Challenge (2016), join Henry as he seeks to win Tori’s love and they’re both reminded of how God is always faithful in His promises. A Serendipity Christmas celebrates the very best of the holiday season—love, faith, family, small-town charm, and the true miracles of the Christmas season.